(Nanowerk Spotlight) Advances in micro- and nanoscale engineering have led to various mobile devices that either can move on solids (see: Nanotechnology reinvents the wheel) or swim in fluids (see: Swimming microrobots propelled by bacteria). Researchers are applying various strategies to designing nanoscale propulsion systems by either using or copying biological systems such as the flagellar motors of bacteria or by employing various chemical reactions (see: Rolling up nanomembranes to build self-propelled microjets). Many of these approaches are fairly complex and not necessarily suited for large-scale deployment in practical applications. Scientists have theorized about simpler designs for mechanical swimmers that avoid the complexities of biological mechanisms and use very few degrees of freedom. 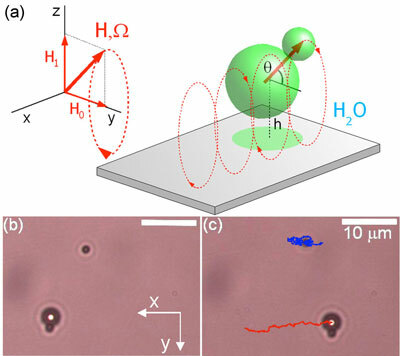 Researchers in Spain have now demonstrated the experimental realization of a simple device made by microscopic colloidal particles which can be externally controlled and propelled at low Reynolds number condition, i.e. when the viscosity of the fluid dominates over the inertia of the object. This is the same condition that governs the motion of bacteria such as E. Coli or other micro- or nanoscale objects that move in a fluid. "Our artificial swimmer is based on the principle that rotation of a small object close to a surface will generate propulsion due to the hydrodynamic coupling of the object with the surface," Dr. Pietro Tierno tells Nanowerk. "The rotation is induced by an external magnetic field. The basic idea of this hydrodynamic interaction is not new, it is actually a quite well known concept in fluid mechanics. However, to my knowledge, the experimental realization of this concept on such a small scale and with colloidal particles is new." Tierno, a postdoctoral fellow in the Departament de Química Física at the Universitat de Barcelona, has worked with scientists from various other departments at his university to experimentally demonstrate and theoretically describe a principle of directed propulsion based on the rectification of the solid rotation of a magnetically driven colloidal doublet immersed in a viscous dominated confined fluid. The team published their findings in the November 21, 2008 online edition of Physical Review Letters ("Controlled Swimming in Confined Fluids of Magnetically Actuated Colloidal Rotors"). "We have shown that DNA-linked assemblies of paramagnetic colloidal particles dispersed in water and floating above a flat plate can be propelled in a controlled way," says Tierno. "Our artificial swimmer is actuated in a nonintrusive way through external magnetic fields, can be readily scaled down to nanoscale, and can be efficiently steered." Unlike other swimmer designs, whose mobility would be hindered by channel boundaries either due to friction forces or by depleting the chemicals needed to power them, the Spanish team's swimmer takes advantage of bounding planes, which makes it particularly suited to operating in microfluidic devices. Tierno points out that, although their design is based on anisotropic composites of microparticles, many other elongated magnetic micro- or nano-objects could be equally actuated such as, for example, ferromagnetic nanorods. Swimming in viscous fluids is not a simple task for small objects since the flow equations are linear and time reversible. This means that, for example, a simple object such as a scallop (which opens and closes its shell based on one hinge) cannot propel itself because it makes a reciprocal motion, i.e. a periodic backward and forward displacement; a principle that has become known as Purcell's scallop theorem ("Life at Low Reynolds Number"). "In viscous fluids, microorganisms such as bacteria have evolved sophisticated methods to achieve propulsion in these conditions," says Tierno. "It is very difficult to realize miniaturized devices which can replicate bacterial motion. That is why researchers have been looking for different approaches to find a simple solution of this problem. We provide one of these approaches." 1) Simplicity – their swimmer is formed by only two colloidal particles. 2) Versatility – while this swimmer presents only a proof of concept, it is feasible to use a large variety of particles that could equally be propelled by using this mechanism. 3) Scalability – in principle, it is possible to up- and downscale the size of the particles. One possible application area for this swimmer is as a micro- or nanoscale delivery vehicle, e.g. the controlled transport of drugs or biological entities attached to the colloidal particles. Tierno mentions that is not difficult to chemically functionalize the surface of the colloidal particles in order to attach or selectively bind cells, proteins, bacteria or DNA. Going forward, the Spanish team plans to experiment with their swimmers in microfluidic devices. Preliminary results from these experiments have already been accepted for publication (in The Journal of Physical Chemistry B). Other experiments are planned to test the swimmers as load carriers and transport small quantities of material in one direction. Finally, the team is planning to theoretically and experimentally explore the interactions between two or more of the swimmers.